Mr. Abe was an integral part of the creation of Hinode Taiko (we wouldn’t have a name without him!) and was a vital member of the JC community. Mark your calendars! 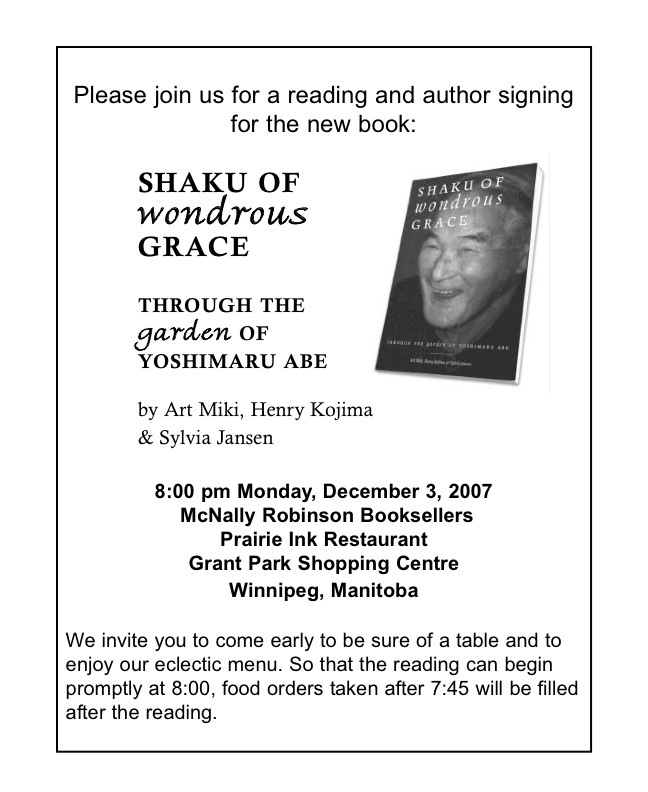 A respected Winnipeg builder, an artist, and gardener of the celebrated Japanese Gardens of Winnipeg’s Folklorama, Yoshimaru Abe was an active citizen in his communities his whole life. It was Abe-san who gave a newly-founded taiko group in the middle of the cold Prairies the name Hinode Taiko in 1983, and watched our progress with kindly interest over the ensuing decades, until his death in 2006. Hinode Taiko remembers his wise presence, and joins the Winnipeg community in celebrating the launch of a work that will help to ensure Abe-san’s spirit and influence continues to speak to future generations.